The microscopic particles (PM2.5) in wildfire smoke pose significant human health risks. Residents most likely to feel these effects are children, the elderly and people with existing heart and lung conditions. People often wonder how to protect themselves and their families during episodes of thick smoke. 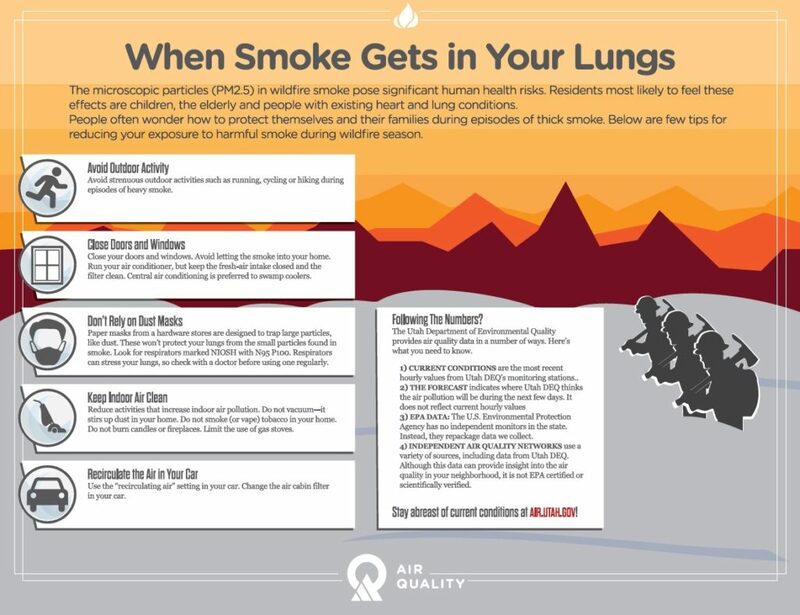 Below are a few tips for reducing your exposure to harmful smoke during wildfire season. Avoid Outdoor Activity- Avoid strenuous outdoor activities such as running, cycling or hiking during episodes of heavy smoke. Close Doors and Windows- Close your doors and windows. Avoid letting the smoke into your home. Run your air conditioner, but keep the fresh-air intake closed and the filter clean. Central air conditioning is preferred to swamp coolers. Don’t Rely on Dust Masks- Paper masks from a hardware store are designed to trap particles, like dust. These won’t protect your lungs from the small particles found in smoke. Look for respirators marked NIOSH with N95P100. Respirators can stress your lungs, so check with a doctor before using one regularly. Keep Indoor Air Clean- Reduce activities that increase indoor air pollution. Do not vacuum- it stirs up dust in your home. Do not smoke (or vape) tobacco in your home. Do not burn candles or fireplaces. Limit the use of gas stoves. Recirculate the Air in Your Car- Use the “recirculating air” setting in your car. Change the air cabin filter in your car. Following the Numbers? The Utah Department of Environmental Quality provides air quality data in a number of ways. Here’s what you need to know. Current Conditions are the most recent hourly values from Utah DEQ’s monitoring stations. The Forecast indicates where Utah DEQ thinks the air pollution will be during the next few days. It does not reflect current hourly values. EPA DATA: The U.S. Environmental Protection Agency has no independent monitors in the state. Instead, they repackage data we collect. Independent Air Quality Networks use a variety of sources, including data from Utah DEQ. Although this data can provide insight into the air quality in your neighborhood, it is not EPA certified or scientifically verified.